Oshino Hakkai (忍野八海) is the eight springs located in Oshino, Yamanashi. The spring water at Oshino Hakkai is underground water from Mt. Fuji. It begins with the snow on the top of Mt. Fuji. When the snow melts to water, the water sink into deep underground of Mt. Fuji, and filtered by rocks of lava. 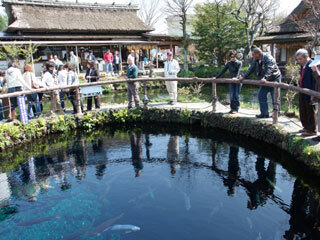 The water travel over 80 years to finally spring at Oshino Hakkai. After filtration by lava, the water become so pure and contain the large amount of minerals. There are many parking, food stands, restaurant and gift shops are around Oshino Hakkai.